Demonetization of Rs.500 & Rs.1000 notes which was announced by the Prime Minister of India on 8th November 2016 has had a negative impact on micro finance institutions (MFI). 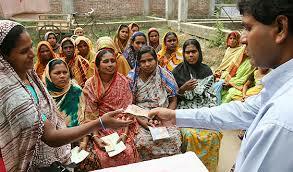 Microfinance largely works in the grassroot level and majorly deals with cash transactions. So due to cash crunch as a result of demonetization the MFI sector was impacted adversely. RBI had provided a 60-day relief to MFIs struggling to collect repayments on their loan dues due to a shortage of cash. MFIs are slowly coming back to normal currently as currency availability is increasing in the economy. MFIs thrive on local knowledge & access to un-banked rural areas. Loans are disbursed to people with no collateral, credit history and documentation is low and thus they can charge a premium interest rate. But this situation is likely to change with the government focusing on banking for all and direct bank transfer of subsidy & government schemes. With Jan Dhan accounts, a larger section of rural people will have bank accounts with which they may get cheaper loans. The creation of small finance banks will take away some portfolio from MFIs as some big names, such as Bandhan, have already ventured into banking.But we feel even then there will always be a space for unsecured loans without collateral which are provided by MFIs. The Government focus on rural development will indirectly benefit MFI growth. Thus the MFI sector is now in the thick of action with many opportunities and challenges. The Union Budget 2017-18 will be presented on 1st February 2017. What tops the wish list for MFIs is a growth-oriented budget and bold reforms which spurs business in rural areas served directly and indirectly by MFIs. The budget should substantially increase allocations to various rural schemes focused on farm, rural and social sectors. There is a long-pending demand of ending ‘step-motherly treatment’ to MFIs in comparison with banks and creation of a level playing field with special focus on finance to small business where MFIs can play a better role than the banks. In the last budget in 2016 NBFCs were allowed to claim tax deductions on the provisions for Non-Performing Assets (NPAs) up to 5% of total income while banks currently enjoy 7.5% tax breaks on NPAs. Tax deductions on NPA for NBFCs should thus be brought in par with banks. In addition service tax on the processing fee charged and micro insurance service provided by MFIs should be exempted as it is the poor borrower who has to ultimately bear the cost. MFIs also feel the budget should address the shortage of domestic equity funds by expanding the SIDBI Microfinance Equity Fund. It should have a corpus of at least Rs 1,000 crore so that it can extend more equity to MFIs and measures should be taken to make its access easier for MFIs, with more equitable terms and conditions. In the last budget in February 2016 credit target under Pradhan Mantri Mudra Yojana (scheme launched to benefit small/micro entrepreneurs) was allotted Rs. 1,80,000cr for FY17. We expect this should be raised further in excess of Rs.2, 00,000cr in the upcoming budget. According to Md Yunus, Nobel laureate and pioneer of microfinance, we should have a separate microfinance regulatory authority similar to Bangladesh Microfinance Regulatory Authority which would focus and help Indian microfinance sector rapidly. Currently, RBI regulates the MFI sector in India. There are very high expectations from the Budget on 1st February post demonetization & how much of it will be fulfilled needs to be seen.